SUPERMAN: He's the world's most recognized hero. Known to Earth as Superman, Clark to his friends, and Kal-El to his family, Superman was rocketed to Earth escaping Krypton's destruction just as his cousin, Supergirl did. Upon his arrival as just a baby we has found by the Kents and raised as their own. His cousin, Kara, was meant to be there with him as she was 12 years old at the time but was delayed being caught up on her way there. By the time young Kara arrived, Kal had already grown up to become Superman! With over a decade of being the Man of Steel, he is overjoyed that his cousin made the moral choice of helping humanity by becoming Supergirl! 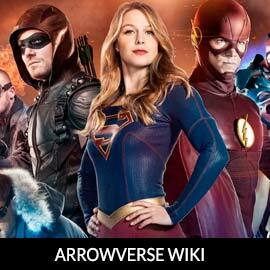 For more on Superman, check out our partners at ArrowverseWiki.